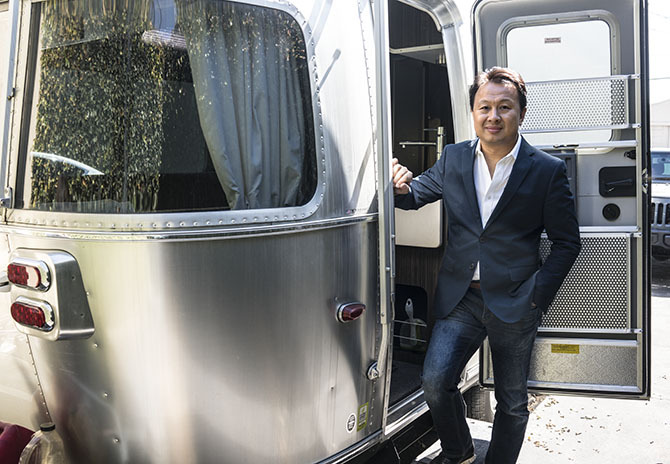 There is no designer quite like Christian Tse when it comes to engineering a jewel. Once an idea gets a hold of him, he will spend years refining historic manufacturing methods and inventing new techniques to execute his concepts. Inevitably, his most mind boggling pieces are made with platinum. Very early in life Christian started working on the jeweler’s bench. When he was just a kid, his father paid him a quarter to size rings at his jewelry company that was known for creating traditional Chinese work. It wasn’t long before Christian began to play around with design and went on to attend the Gemological Institute of America (GIA) to further advance his knowledge in the field. Flash forward to 1996, Christian launched his eponymous business with a passion for jewelry, gems and design and absolute obsession with craftsmanship. Shortly thereafter his signature mesh statement pieces and other creations were seen on stars ranging from Michael Jackson to Sarah Jessica Parker, Beyoncé and Jennifer Lopez. His magnificent fancy color diamond jewelry resulted in the creation of a pink diamond ring for the 2006 remake of The Pink Panther starring Steve Martin. 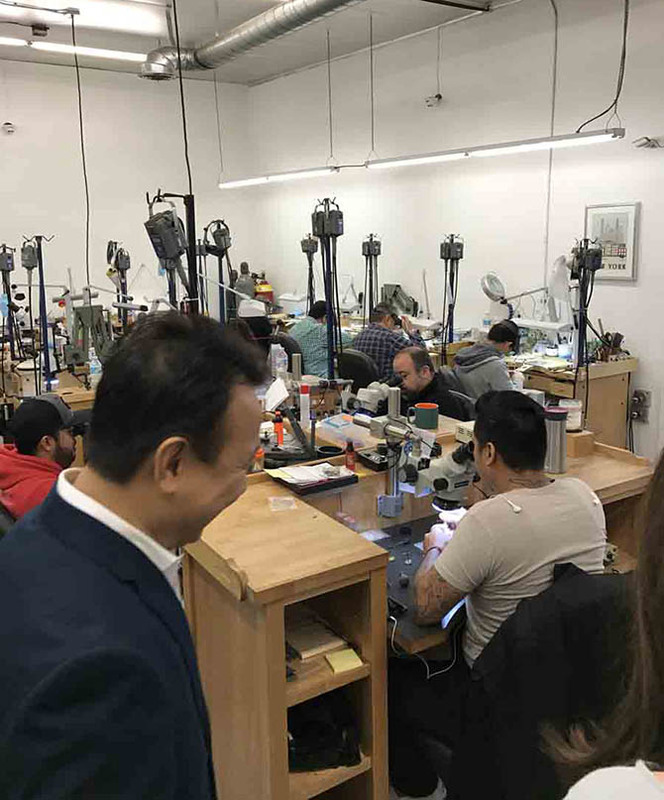 The impressive in-house operation that covers every stage and style of production has made Christian the go-to guy for some of the biggest names in jewelry. Yes, that’s right, jewelers everyone knows don’t always travel to Paris or New York when they want to make special pieces of High Jewelry. Sometimes, they head to Monrovia, California. 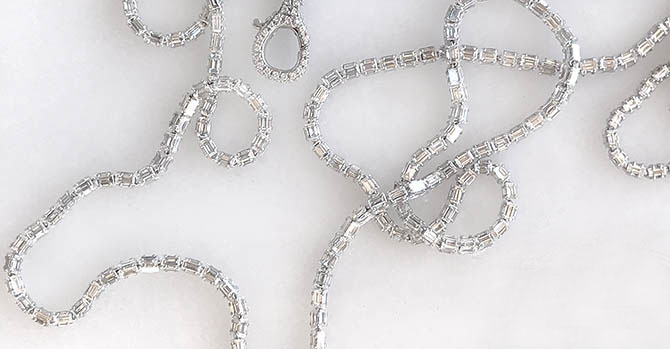 The transformation of a good portion of his company into an elite American manufacturing destination has changed the nature of some of Christian Tse’s jewelry collection into highly experimental work. 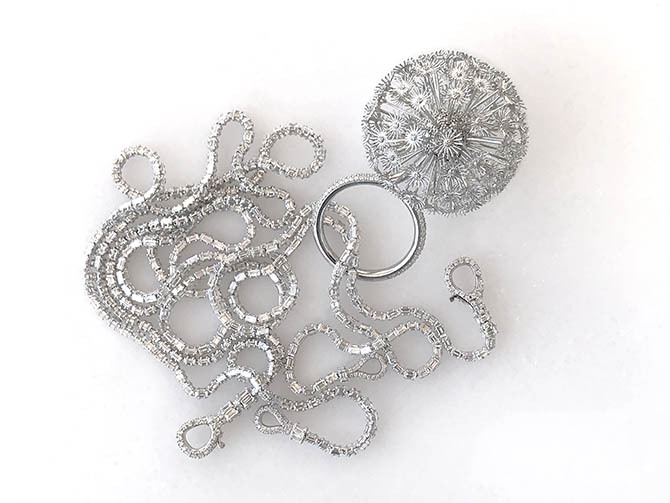 I sat down with the talented designer, who has won the prestigious Couture Award in the Platinum category an unprecedented three times, to talk about several of his most wildly creative platinum and diamond pieces. How do you describe your collection today? I am always thinking about that because I feel like a lot of designers have a very specific look, but there is no one look in what I do. Some jewels are very geometric. Others are inspired by nature. The things I am doing now are usually driven by techniques. Your Dandelion Ring is a masterwork. Tell me about the process of creating it. The dandelion is such a beautifully engineered piece of nature. When the seedlings blow away from the flower, it’s the top part that actually carries it off. 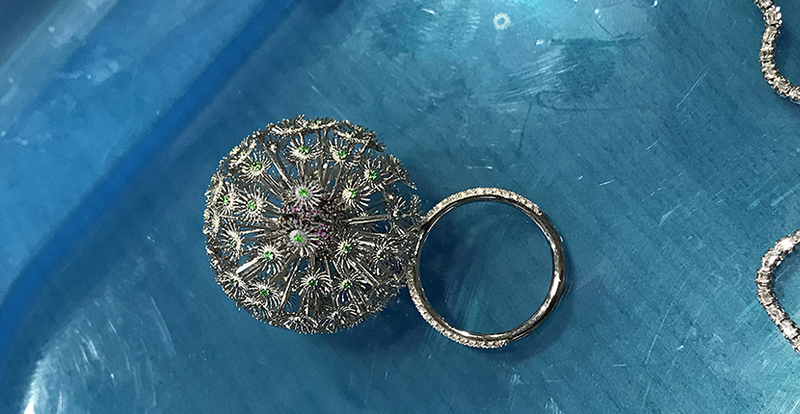 When I was thinking about making the ring, I would go outside and find dandelions and study them with a jeweler’s loop and ask, how would I assemble it? I looked back in history to see if dandelion jewels had been made before. 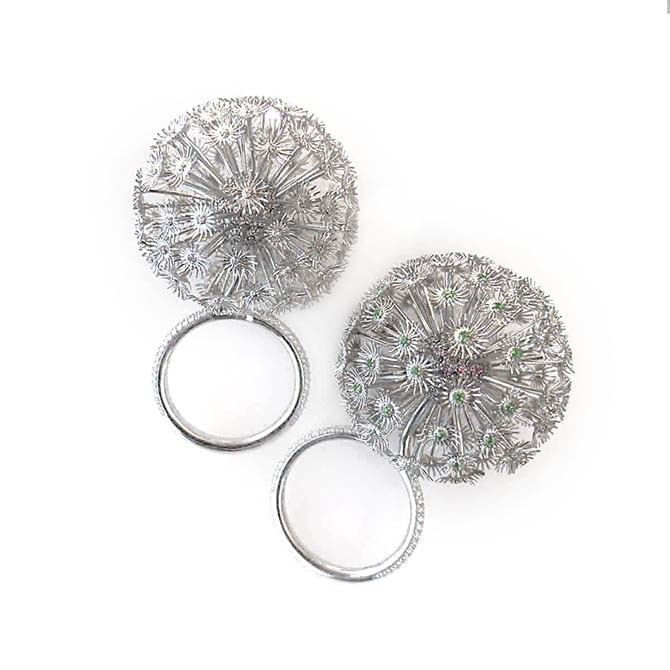 Tiffany did a dandelion brooch during the early twentieth century that was beautiful but doesn’t fully capture the natural look. I was thinking how would I do it? I knew it would be very hard in such a confined surface space to pack on hundreds of seedlings. I knew platinum was the metal that could make the dandelion ring come to life, because it has the properties where you can heat it up and it won’t meltdown. The piece couldn’t be made in gold. The other sides would react to the heat. Platinum absorbs the heat and you are able to do detailed work. I called companies with top engineers in Germany and Japan in search of micro tools to execute the design. No one had anything small enough. I got so frustrated. Finally, I said we are going to make the tools to make the jewelry. We made two dandelion rings. One is set with diamonds. On the other, we used pink sapphires on the core and emeralds at the center of the seedlings. They suggest the colors a dandelion picks up from grass and the sun. All 288 seedlings on each ring move gently. Once we figured out the way we were going to do it, the jewel probably took three months to make. Thinking about the jewel and the mistakes, the trial and error took almost two years. 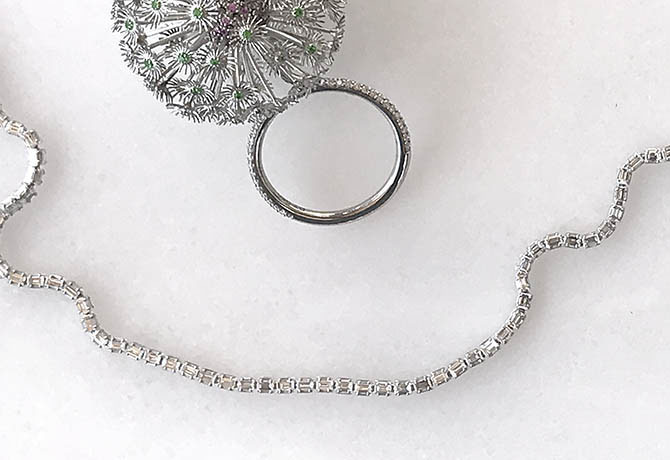 Your baguette-cut diamond and platinum chain is more of a subtle masterwork. The macro part of everything is the beauty. I was asking myself, how do you set the stones untraditionally? Everyone does channel setting. We came up with four prongs to hold each stone. There is very little metal needed or used on the piece to hold the gems in place. Each prong is cut down by an engraver rather than with traditional tools. This work can only be done with platinum because of the characteristics of the metal. When you try to do it with any other metal, it would melt faster and you would have a hard time assembling it. Even with platinum, it was a challenge. The piece took us almost 9 months to make. 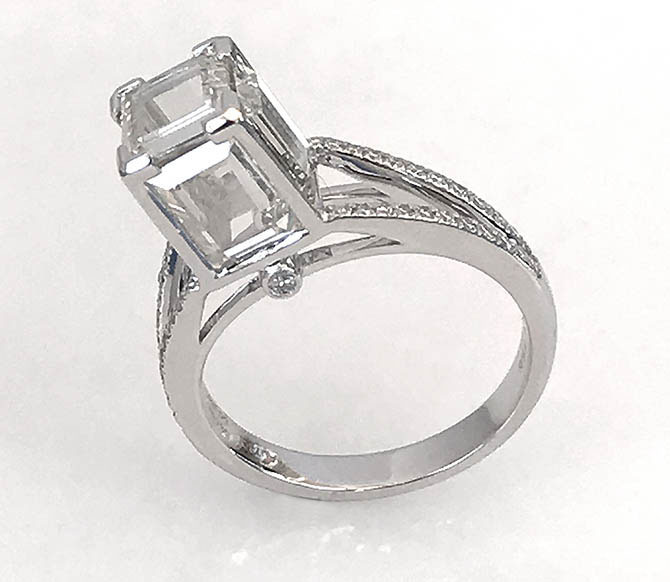 What was the inspiration for your diamond and platinum Cube Ring? I looked at a parcel of picture frame diamonds and saw a fish tank. I love fish tanks. I love to encapsulate everything. We engineered platinum prongs and a ring to make a miniature cube. The cube is set with five picture frame diamonds. Created in partnership with PlatinumJewelry.com. This post is one of a series of stories about designers who specialize in platinum.